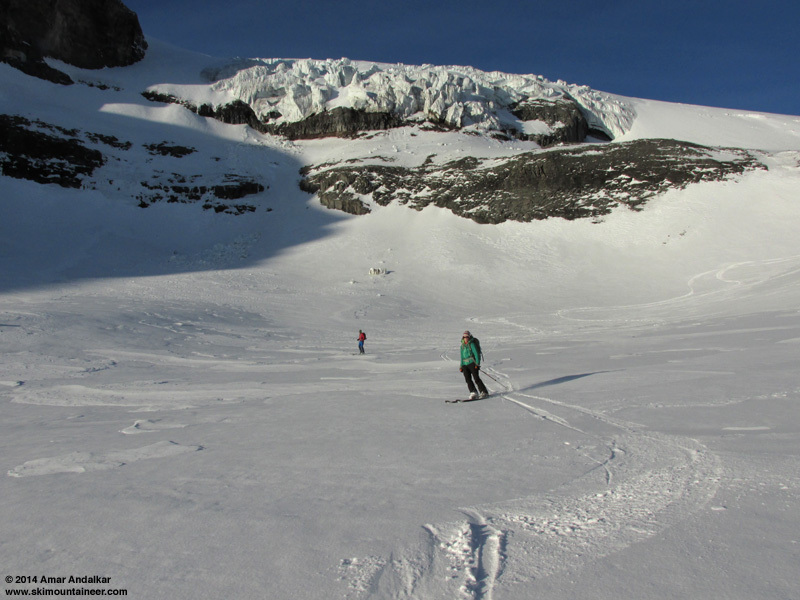 January 5, 2014, Mount Rainier, Whitman Glacier: Visiting the July 2013 Avalanche Site + Bonus Ice Cave! Looking out of the ice cave entrance near 6500 ft below Whitman Glacier. 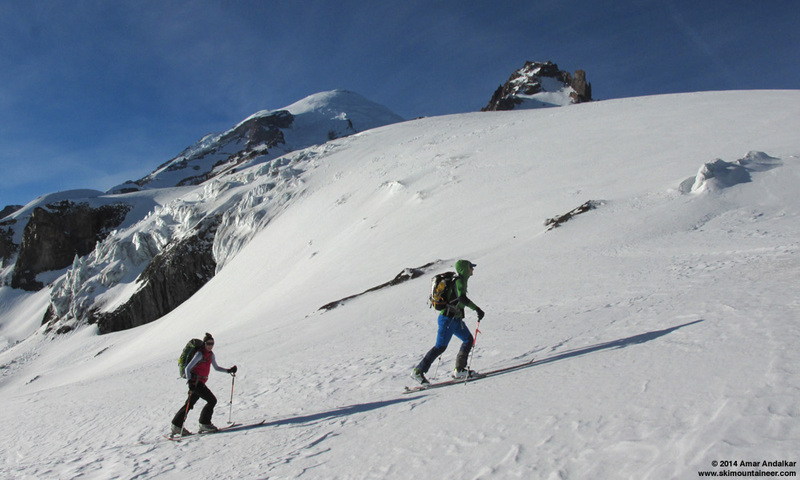 The exceptionally scenic route from Paradise to the Whitman Glacier via Cowlitz Rocks saddle is one of my favorite ski tours on Mount Rainier, offering a combination of jaw-dropping views, hassle-free glacier travel, and a feeling of real remoteness and solitude despite being so close to the hubbub of Paradise -- with the bonus of providing the best winter and spring ski access to the 11138 ft satellite peak of Little Tahoma. I've made a handful of trips via this route over the past few years, most recently a summit and ski descent of Little T in June 2013 (see TR and first reply for detailed route info and comparison). Ever since I visited the site of the unusual summertime avalanche at 8000 ft on Whitman Glacier in July 2013 (approaching via Summerland and Fryingpan Glacier that time), I've been intending to make a follow-up visit to see how the avalanche site and its bed of bare blue glacial ice evolved through the summer and fall. Circumstances conspired against me though, with extremely heavy September snowfall followed by the 17-day government shutdown in October preventing any further access hiking in with skis from the Fryingpan side (due to an early White River Road seasonal closure). 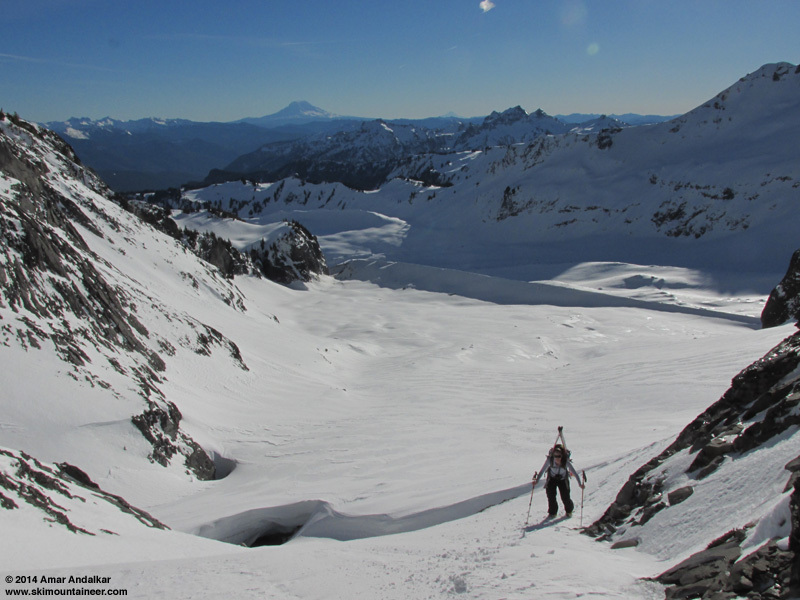 The far-below-normal snowpack throughout the rest of the fall prevented easy ski access from the Paradise side, with the crux being the need for the Cowlitz Glacier moraine at 6200 ft to be well-covered in snow. With much-belated winter storms about to arrive in full force this week, I realized that the sunny first weekend of January would provide the last chance to see anything at the site at all. A New Year's Day trip to Camp Muir and telephoto view from Muir Rock revealed that the avalanche site was still barely visible, and the Cowlitz moraine was finally well snow-covered, so it was now or never -- or at least not until next summer (assuming that the net snow mass balance at that location on the glacier is negative for this year, enough to expose the site once again by late summer of 2014). I'd been trying to rally some partners for this trip the previous few days with no luck, and I really didn't feel like going solo into a fairly remote part of the park at this time, where I was near-certain to encounter no one else all day and return well after dark. So I sent out another batch of partner-seeking texts on Saturday evening after skiing powder laps at Alpental, and thankfully Alisa and Mike M (who was with me on the Little T trip in June) were eager to join me. 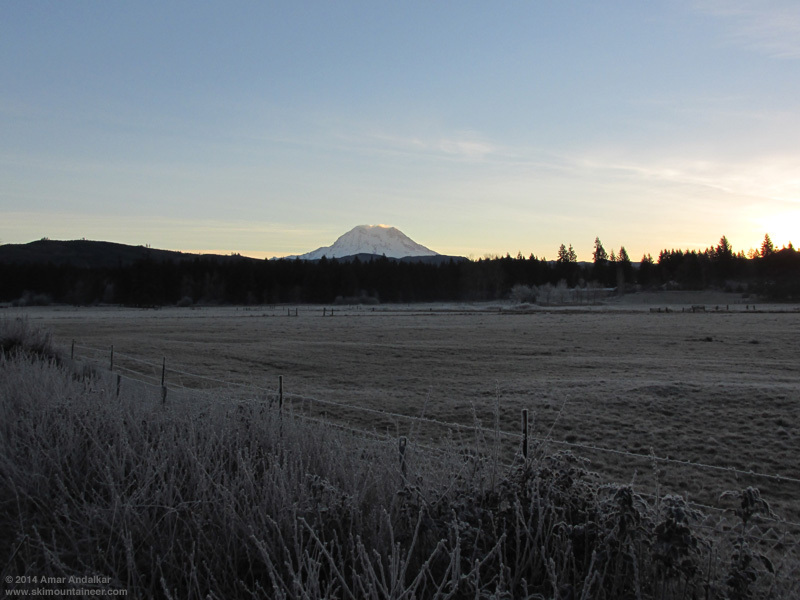 The morning drive to Rainier featured some of the scariest driving conditions I've ever seen on SR 167, with freezing fog producing thick frost and ice on every overpass and bridge (rest of the highway was OK) for a several mile stretch. Just super slick and scary, even at far below 60 mph and in four-wheel-drive, barely maintaining control -- others were not so lucky, with several spun out and wrecked along the way. 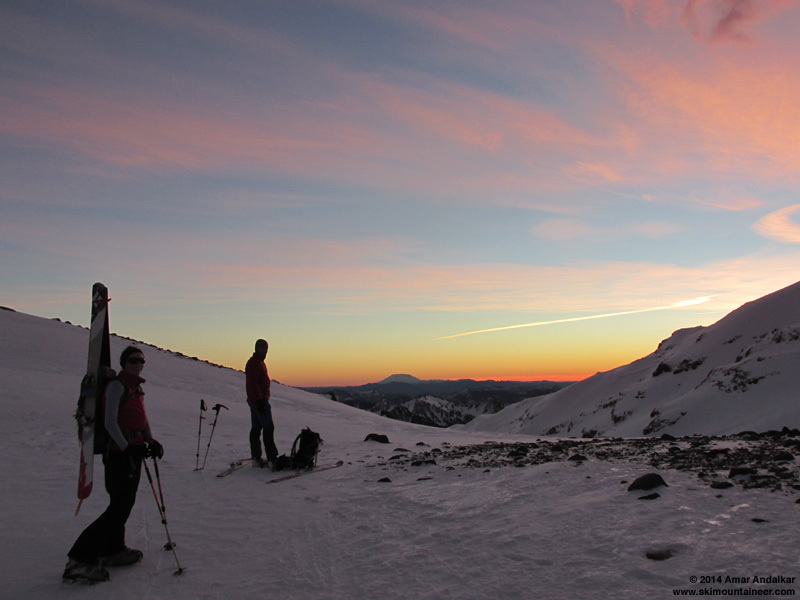 We worried that it might be icy all the way to Rainier, but thankfully we climbed out of the freezing fog at South Hill, and there were no more icing problems the rest of the way. With the Longmire gate not opening until 9am this winter (even on sunny days with no plowing needed) and being re-locked at 5pm with citations threatened for those who are late, it would be a tight squeeze to fit this trip into the National Park Service's imposed schedule constraints. 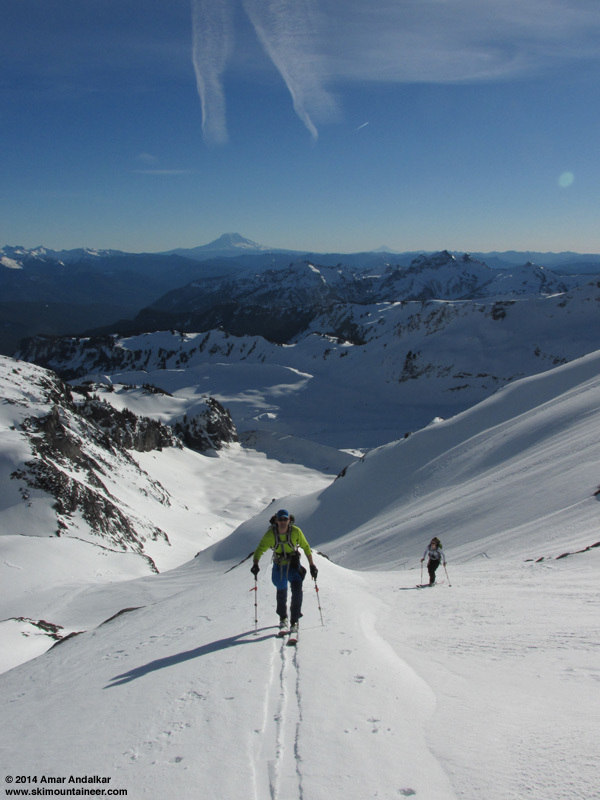 Even going no higher than 8000 ft, it would be almost 5000 vert and 12 miles roundtrip given the 900 ft drop into the Cowlitz Glacier's valley, and prior experience told me that this route always took much longer than numbers alone would suggest. Luckily we managed to convince the law enforcement ranger directing traffic in the Paradise parking lot to let us park near the SE end of the lot closer to our destination, thus reducing our roundtrip distance by about 200 yards (yup, had to negotiate just to be allowed to park within a different fully-legal between-the-white-lines spot, instead of where he wanted us to park). The 200 yards saved was actually well worth it, as the parking lot had large areas of slick ice which were causing numerous hard falls. We skied down the short 200 vert of road descent to 4th Crossing just before 10am and skinned up Mazama Ridge after a quick chat with Robie and his group at the 5200 ft bridge. About 4-5" of powder from the most recent snowfall overnight on January 2-3 sat atop a firm rain crust on this part, followed by a patchwork of powder, smooth windpack, and bare shiny water ice as we neared treeline atop Mazama Ridge and left the last trees behind at the (buried) Stevens-Van Trump monument at 6050 ft. We passed a group of 3 snowshoers just after the monument, and would see no one else the entire day until we reached Longmire well after dark. This same patchwork of powder-windpack-ice would continue throughout the basin of the erstwhile Paradise Glacier ice caves and all the way to Cowlitz Rocks saddle at 7100 ft. An easterly breeze (caused by offshore pass flow) along Mazama Ridge and through the basin kept things cool despite the warm temps and bright sunshine. 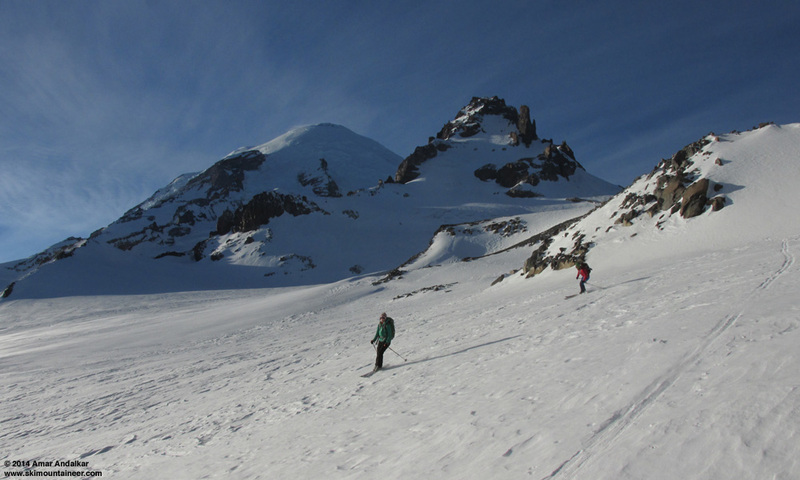 We had hoped that the nice powder found lower down might also grace the 900 ft NE-facing descent from the saddle down to the Cowlitz Glacier, but alas it was not to be -- the same powder-windpack-ice hodgepodge covered this slope too. 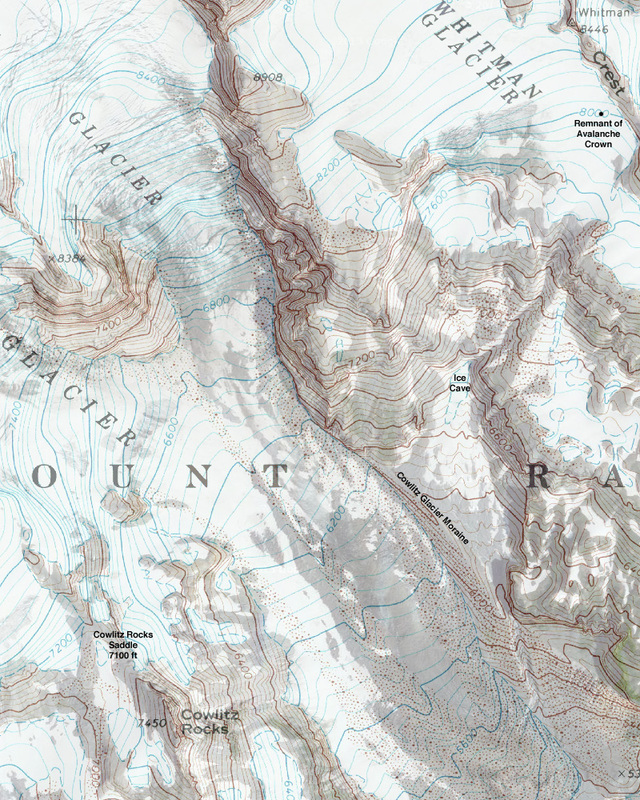 The uppermost part is a convex rollover which reaches about 40� in angle -- ideal avalanche terrain especially given the tremendous amount of wind loading produced by prevailing westerly or southwesterly storm winds flowing through the saddle. With no possible way to dig a representative snow pit on the slope given that we had approached from the west side, we simply had to trust our experience, intuition, and observation. No signs of instability had been observed on any slope or aspect thus far (including similar wind-loaded NE aspects off Skyline Trail ridge above Golden Gate), so we expected things to be OK -- we dropped in gingerly just after noon, to find that stability was excellent with nothing moving at all. Pretty decent turns were found by sticking with the powdery portions of the patchwork as much as possible. 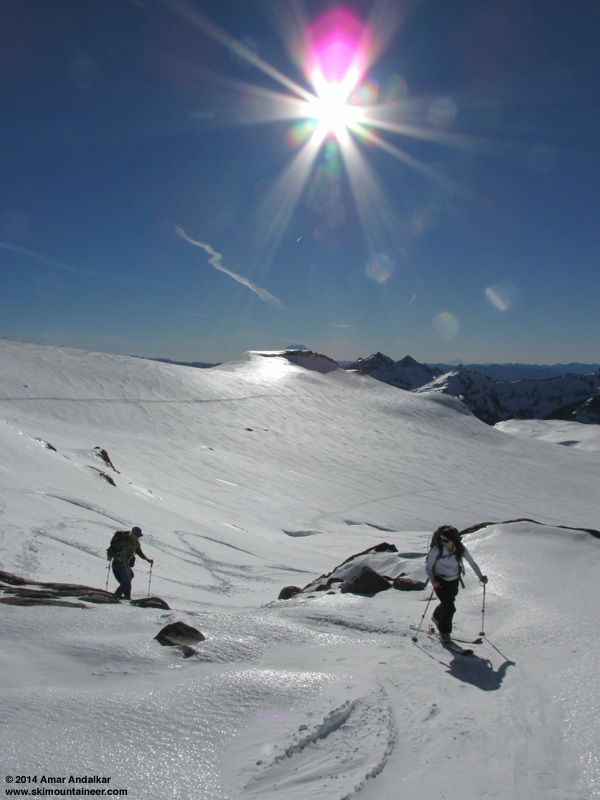 We stayed fairly high and to the left to ski a descending traverse across the glacier near 6300-6200 ft. 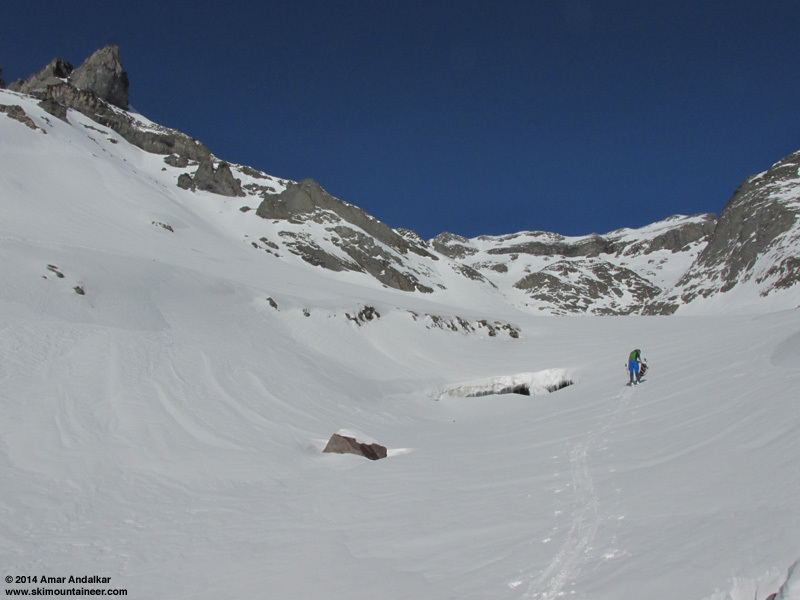 The uppermost end of the moraine looked unappealing and rocky, so we skied nice powder down the east edge of the glacier to 6100 ft, below the spot which looked most conducive to skinning up the moraine. Ski crampons plus the softening of sunshine on the steep 35+� slope of the moraine made it skinnable without too much trouble or sketchiness. The crest of this moraine is a sharp knife-edge ridge at about 6200 ft, and we traversed back north along it until the slope to its east rose to meet it, allowing an easy exit off the moraine crest with minimal elevation loss. 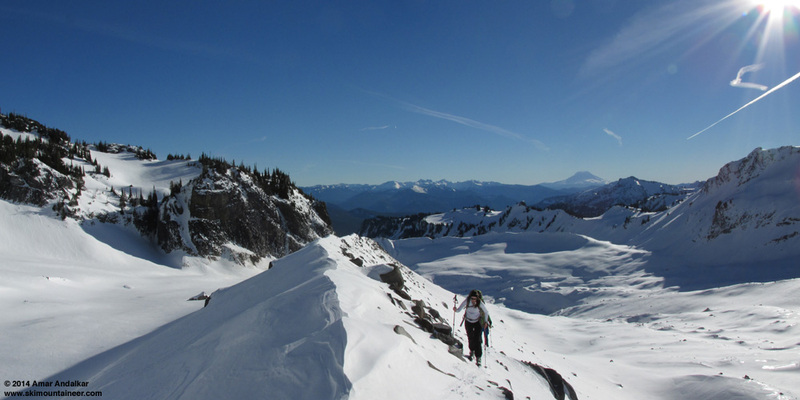 Two-shot panorama skinning up the Cowlitz Glacier moraine. As we began ascending the broad alluvial fan east of the moraine (the Whitman Glacier formerly extended all the way down to this slope), a dark hole in the snow ahead soon caught my eye -- we angled towards it to find the entrance to a cave. 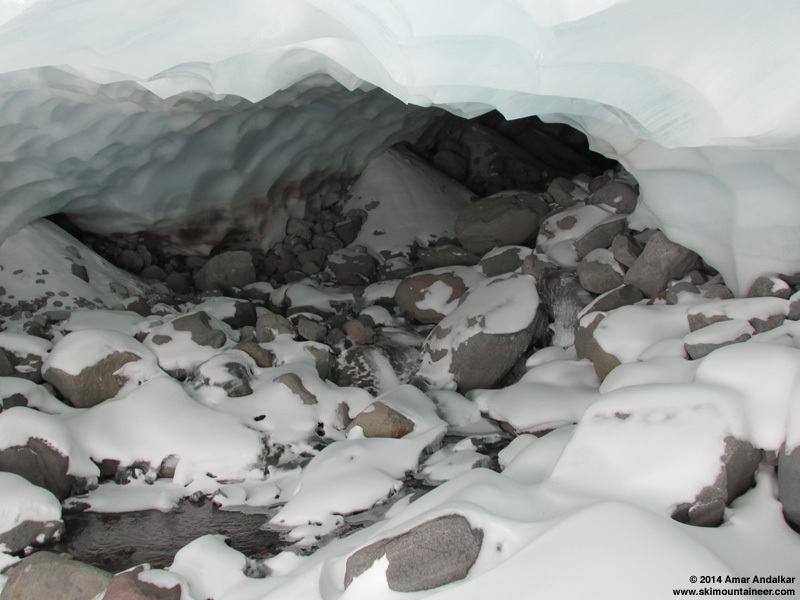 It turned out to be a substantial ice cave located within a semi-permanent snowfield near 6500 ft, formed (as usual for such caves) by a combination of flowing water to carve the initial tunnel at the base of the snow-ice and enlarged by airflow through the tunnel after the water level dropped. 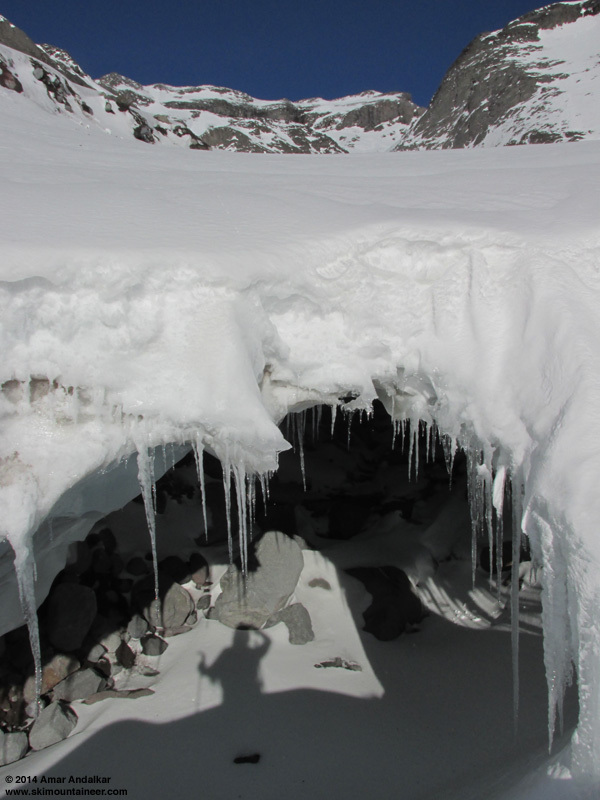 The roof of the cave looked solid enough (although obviously, there is always some risk of the roof collapsing suddenly and injuring or killing you, as has happened several times at Big Four Ice Caves!) -- so I ducked and skinned through the icicle studded entrance to find a large chamber 10-15 ft high and 30-40 ft wide, with a main tunnel extending ahead with a small flowing creek, and a smaller branch tunnel to the right with a completely frozen cascade. I could continue skinning about 30 ft inside before the skinnable snow ended, with only rounded cobbles beyond covered by a thin dusting of snow. Very cool to see this, the cave entrance had always been hidden far beneath many feet of deep snowpack the other times I had skinned up this slope, so I had never seen any hint of its existence. My partners were much more wary about entering or exploring the cave, but I convinced one to at least go inside the entrance. 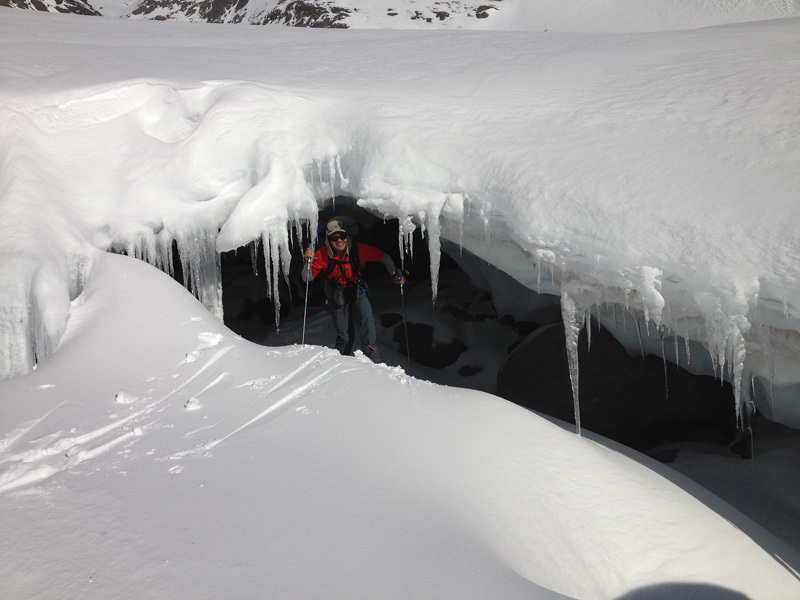 Soon we continued skinning up the slope, giving the cave's expected path a wide berth. Very warm springlike skinning conditions here in a southwest-facing reflector oven, feeling nothing at all like January should. But eventually the smooth slope of the alluvial fan pinches off at a constriction near 6700 ft, with a large rock outcrop in the middle, and it was clear that we were approaching a huge pit at the base of the outcrop which contained the upper entrance of the same ice cave -- which I had also never seen any hint of before on previous trips. This time, I cautiously approached from the side and found that the pit was at least 50 ft deep, leading to a dark hole disappearing out of sight into the blackness. And we needed to get past it -- there were options either to the right or left of the outcrop, with the left looking easier and safer. It even looked skinnable with cautious ski cramponing up a steep slope and across the top edge of a frozen snow-covered waterfall, but the snow (ice) conditions at the lip were uncertain and the consequences of an uncontrolled slide were severe: a swift ride down the icy slope into (what I joked to my partners was) the Great Pit of Carkoon, nesting place of the all powerful Sarlacc. 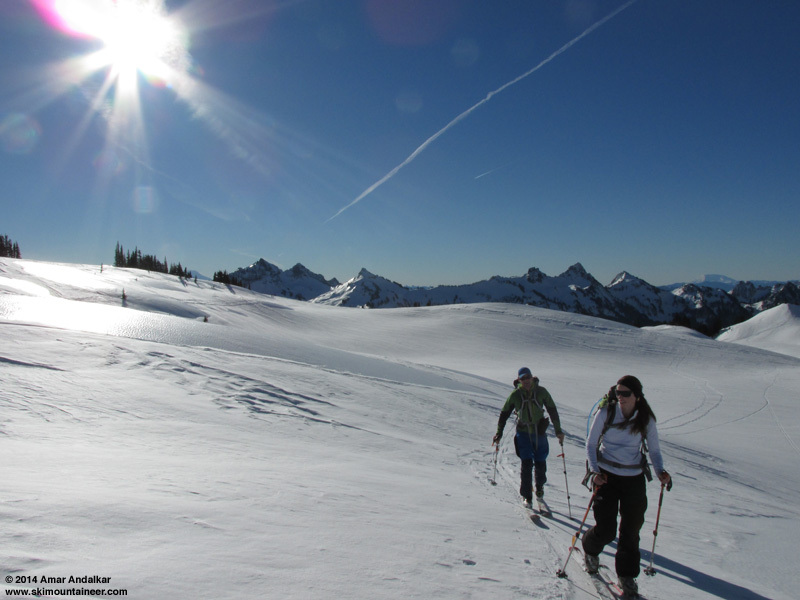 We made the prudent decision to switch to foot crampons to minimize any chance of slipping and sliding (it's always best to bring foot and ski crampons on any real ski mountaineering trip, just in case). We quickly ascended about 200 ft past the Pit and the rock outcrop onto the flatter terrain above. Thankfully as we climbed past, no tentacles came shooting out of the Pit to grab our ankles and drag us into the Sarlacc's gaping maw, where we would have found a new definition of pain and suffering while being slowly digested over a thousand years. 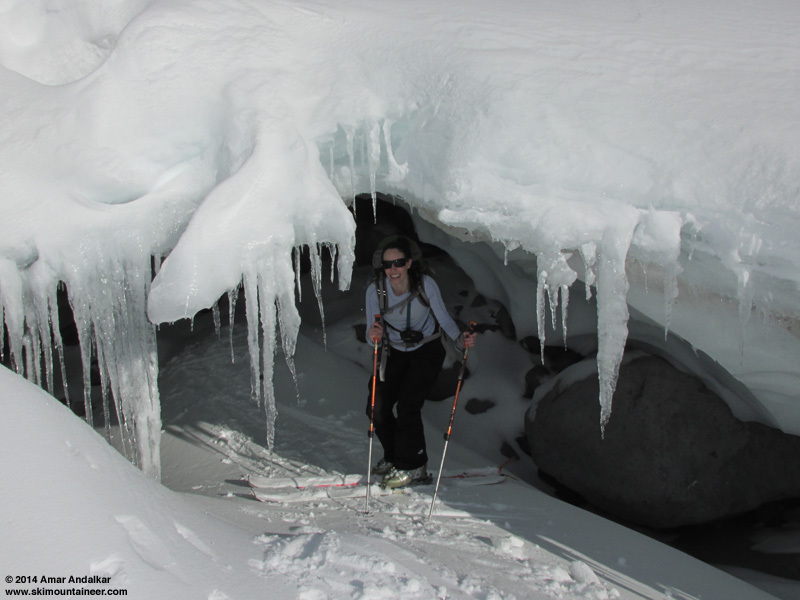 Then back to skinning with ski crampons up the moderately steep slopes above the outcrop and frozen waterfall, easily ascending the sun-softened patchwork of powder-windpack-ice. Ironically, the sun-softened water-ice sections often provided the easiest and smoothest skinning conditions of the whole patchwork. We quickly reached the flat basin at 7400 ft which contains an inactive remnant of the Whitman Glacier, and lies just below the active heavily-seraced ice cliff at the western end of the Whitman's terminus. The low-angle winter sun had done little to soften the snow here on the flats, with large sections a sheet of smooth hard water ice. We followed an easy ramp around the right end of the icy cliffs and up onto the Whitman Glacier proper near 7800 ft, then traversed east towards the avalanche site at 8000 ft. A cold gusty NNW wind began to make things quite chilly on this part, unexpectedly strong gusts of 30+ mph given the forecast for winds of only 20 mph even at 10000 ft. Quite a sharp contrast from baking in the reflector oven only a short time earlier. 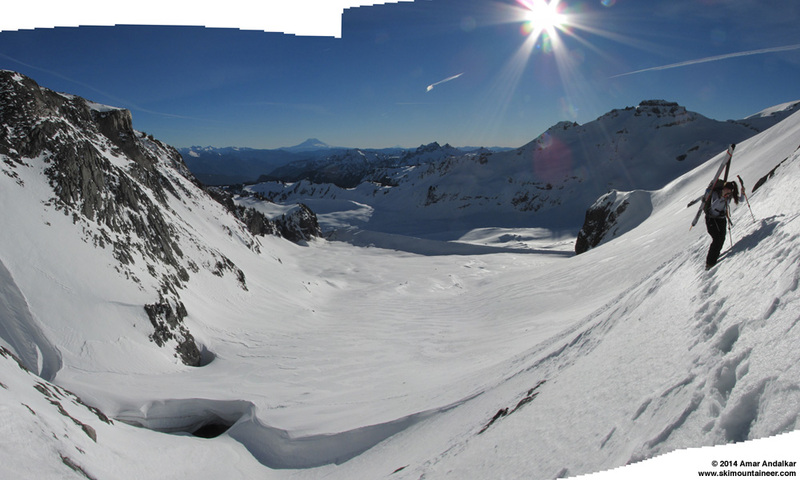 Two-shot panorama skinning up the Whitman Glacier with Big Tahoma and Little Tahoma peeking out above. 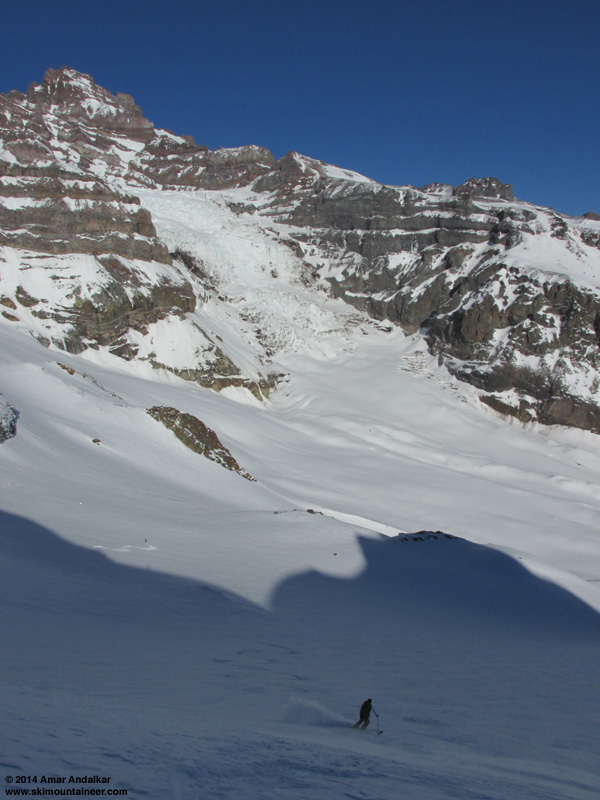 There was very little evidence left of the July avalanche, only a pronounced dip in the surface of the glacier extending across several tens of meters with a maximum depth of a few meters, and a short strip of exposed glacial ice at what was once the east flank of the avalanche bed surface. A bit disappointing for me that there was so little left to see, but roughly what I expected to find based on my January 1 telephoto view from Muir Rock. 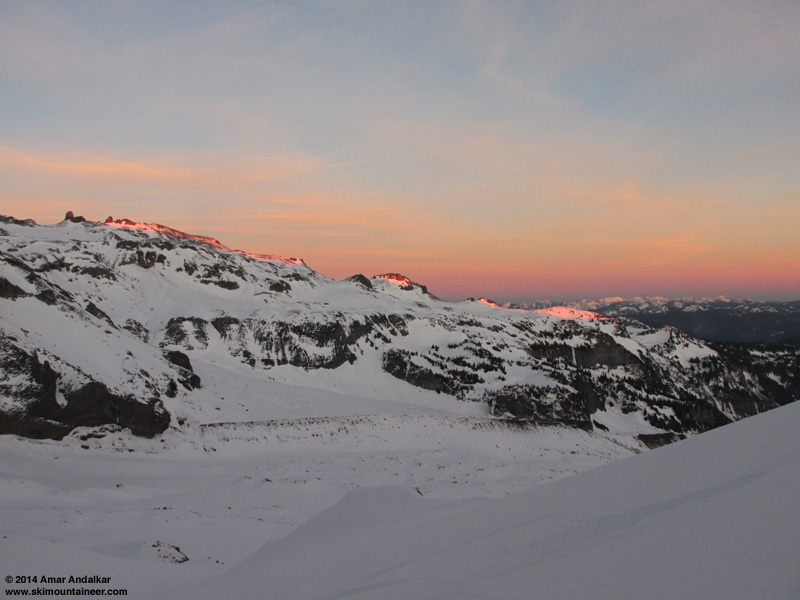 Although there won't be anything to see there for the rest of the winter and spring, I suspect that by mid-late summer this year, the seasonal snowpack at the avalanche site will have ablated away, and much evidence of the event will be visibile in the bare glacial ice. Perhaps something like a large rectangular pit with roughly the dimensions of the original slab, incised several feet deep into the glacial ice. 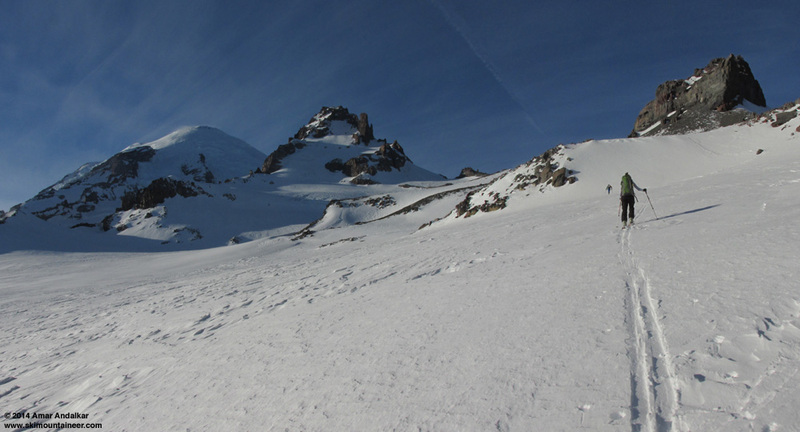 Four-shot panorama of the Whitman Glacier from near the exposed ice (left) at the east flank of the July avalanche site. 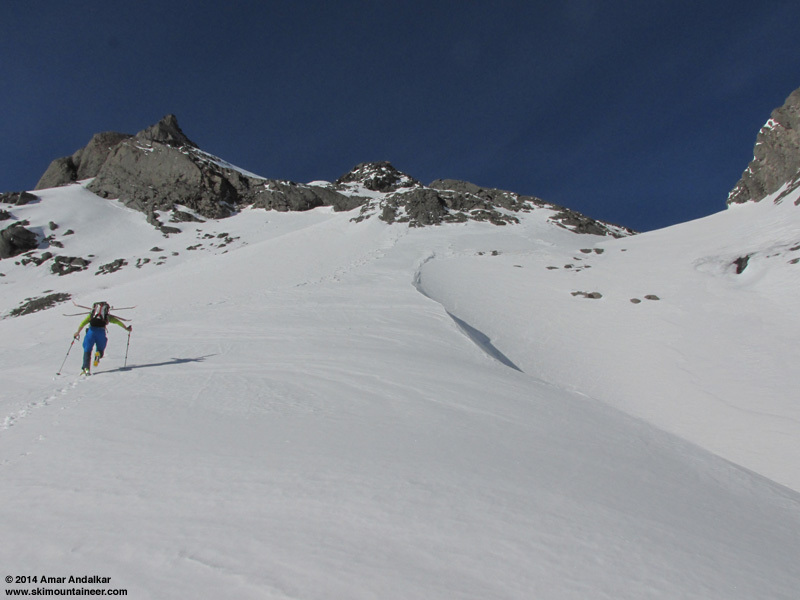 We continued skinning upward for a bit more, mainly trying to quickly find a spot that was somewhat out of the wind. Topped out just after 3pm at about 8300 ft on the edge of Whitman Glacier below Point 8446, with a rocky rib providing partial shelter from the gusty wind. A quick changeover and we were ready to ski down. The snow was mostly smooth windpack, pretty good skiing could be found by following the smoothest strips of snow. 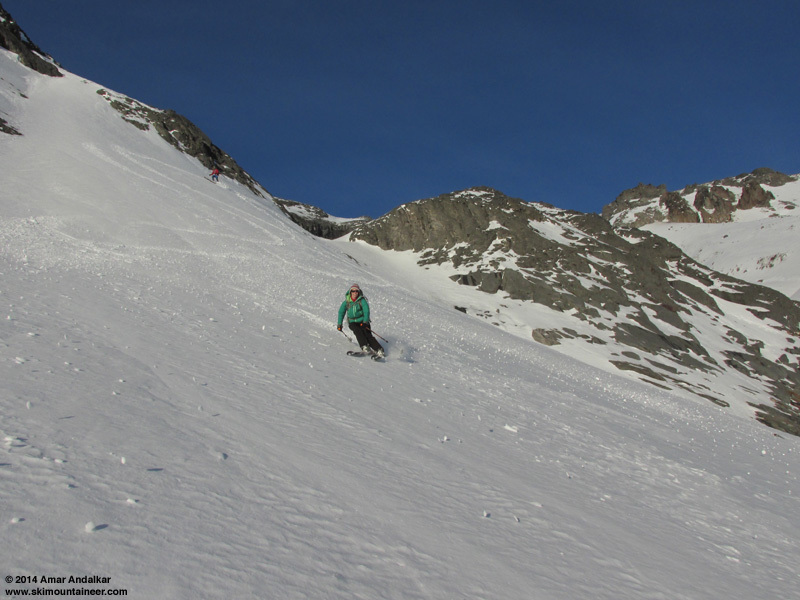 More nice turns in the bowls below the glacier terminus, and even the water ice parts had softened enough here to ski almost like firnspiegel corn. Even the somewhat scary slope past the top of the frozen waterfall above the Great Pit of Carkoon skied nicely in the afternoon sunshine. Still no Sarlacc reaching out to grab us, either. 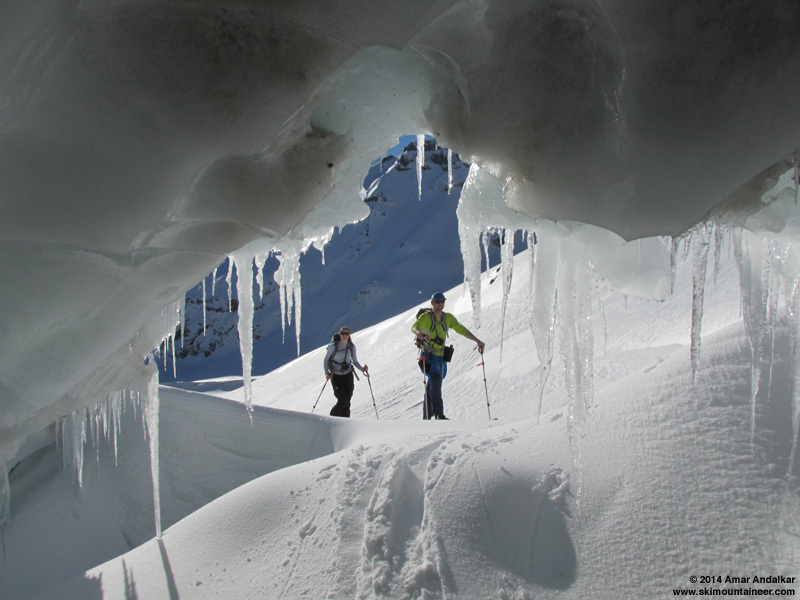 We schussed past the lower ice cave entrance, and down the uppermost end of the moraine (steep and crusty) to reach the Cowlitz Glacier by 3:40pm. We still had a 900 ft ascent here to reach the saddle, and another 200 ft ascent from 4th Crossing if we decided not to try the steep sidehill ascending traverse to Golden Gate (not worth attempting given the conditions). So it was clear that we were going to miss the gate closure time by a large amount. 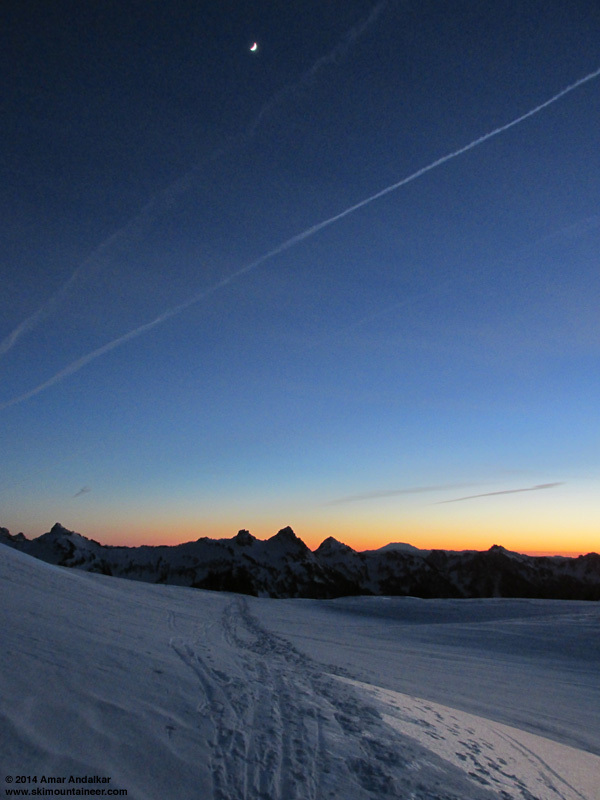 Nothing we could do about it but just get ready, skin across the glacier, then ski crampon up towards the saddle, and enjoy the colors of sunset. 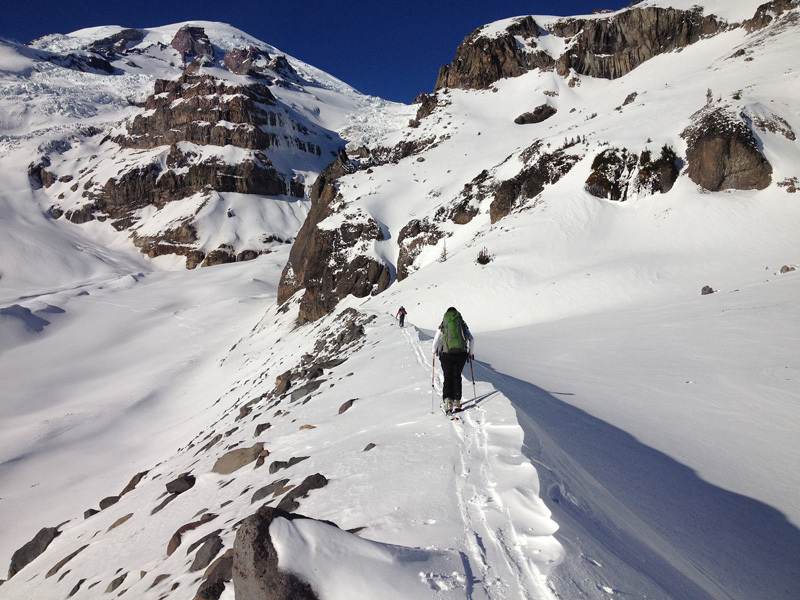 Given the falling temperatures and potentially icy snow, we prudently switched back to foot crampons for the last 200 ft up the saddle, to avoid any issues on the 40� rollover slope -- it probably would have been skinnable though. Topped out on the saddle at 4:45pm, about 10 minutes after sunset. Just totally gorgeous colors, clouds, and crescent moon. Another fast changeover and then quickly straightlining down the smooth slopes back towards Mazama Ridge, the firm crust topped in places by a bit of powder too. The jackpot for ski conditions was the lowest part, from 5900 ft down the west side of Mazama Ridge in 4-5" of smooth powder, still not too tracked out and somehow completely unaffected by a day of warmth and sunshine -- by far the best turns of the day, but we hadn't come just for the turns. The waxing crescent moon provided just enough moonlight to skin the road up to Paradise without headlamps, and we arrived to an empty parking lot at 5:30pm, the law enforcement rangers long gone and the only vehicles left being a few in the overnight lot. Glad to see no ticket on the windshield, and after slowly negotiating the icy road down to Longmire, equally glad to find no hassle in getting the gate opened either: sign the gate register at the Longmire Inn desk, and the cheerful clerk walks all the way over to the gate to open it for you -- first class service! An awesome day of ski touring on the Mountain with excellent partners, outstanding weather, stunning views, surprise ice cave, and sublime sunset. Only about 5200 vert and 12 miles by the numbers, but as usual on this route, feeling like a much bigger day and leaving us all much more worked than expected -- but in a good way. SYNOPSIS...HIGH PRESSURE ALOFT WILL BRING MOSTLY SUNNY WEATHER AGAIN SUNDAY. 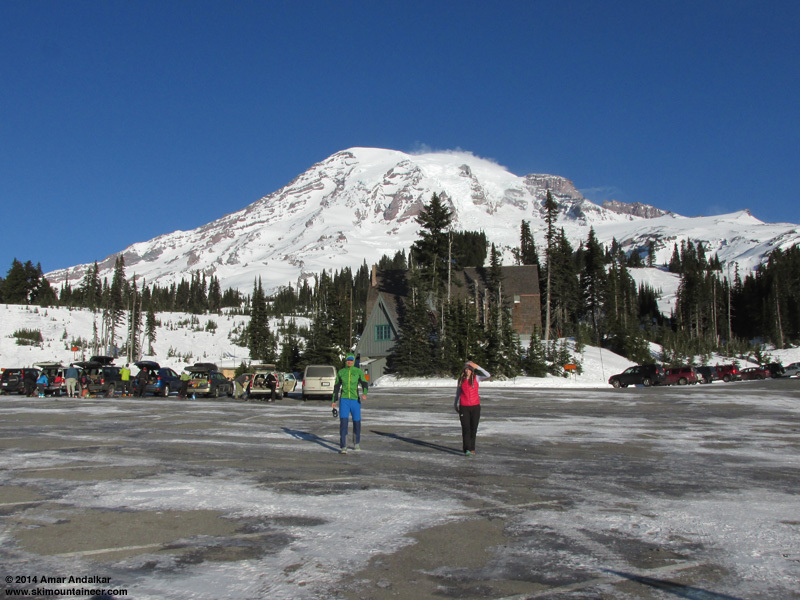 THE UPPER HIGH WILL MOVE INLAND MONDAY...AND A WEAK FRONTAL SYSTEM WILL BRING A LITTLE SNOW AND RAIN TO MOUNT RAINIER NATIONAL PARK MONDAY NIGHT AND TUESDAY AS IT MOVES THROUGH WASHINGTON. THERE WILL BE RAIN AND SNOW AT TIMES WEDNESDAY THROUGH SATURDAY...WITH THE SNOW LEVEL 3000 TO 5000 FEET...AS SEVERAL FRONTAL SYSTEMS MOVE THROUGH THE REGION IN QUICK SUCCESSION. SUNDAY...SUNNY. FREEZING LEVEL NEAR 5500 FEET INCREASING TO 7500 FEET IN THE AFTERNOON. SUNDAY NIGHT...MOSTLY CLEAR. FREEZING LEVEL NEAR 8500 FEET. MONDAY...MOSTLY SUNNY IN THE MORNING THEN BECOMING MOSTLY CLOUDY. FREEZING LEVEL NEAR 8500 FEET DECREASING TO 6000 FEET IN THE AFTERNOON. MONDAY NIGHT...CLOUDY WITH A CHANCE OF RAIN AND SNOW IN THE EVENING...THEN RAIN AND SNOW AFTER MIDNIGHT. MODERATE SNOW ACCUMULATIONS. SNOW LEVEL NEAR 3500 FEET. TUESDAY...BREEZY. RAIN AND SNOW LIKELY. LIGHT SNOW ACCUMULATIONS. SNOW LEVEL NEAR 5000 FEET. TUESDAY NIGHT...RAIN AND SNOW LIKELY. SNOW LEVEL NEAR 5000 FEET. WEDNESDAY...RAIN AND SNOW LIKELY. SNOW LEVEL NEAR 4500 FEET. WEDNESDAY NIGHT...RAIN AND SNOW LIKELY. SNOW LEVEL NEAR 4000 FEET. THURSDAY...BREEZY. RAIN AND SNOW LIKELY. SNOW LEVEL NEAR 3500 FEET. THURSDAY NIGHT...BREEZY. RAIN AND SNOW LIKELY. SNOW LEVEL NEAR 3000 FEET. FRIDAY...RAIN AND SNOW LIKELY. SNOW LEVEL NEAR 4000 FEET. FRIDAY NIGHT...RAIN AND SNOW LIKELY. SNOW LEVEL NEAR 5000 FEET. SATURDAY...RAIN AND SNOW LIKELY. SNOW LEVEL NEAR 4000 FEET. As usual. thanks for the great photos and interesting report, Amar! 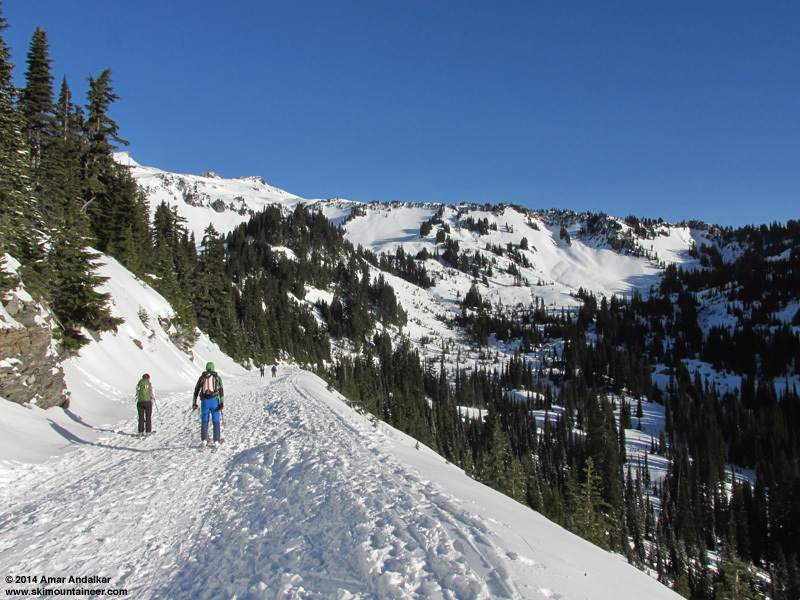 as we neared treeline atop Mazama Ridge and left the last trees behind at the (buried) Stevens-Van Trump monument at 6050 ft. We passed a group of 3 snowshoers just after the monument, and would see no one else the entire day until we reached Longmire well after dark. Most excellent ! It truly is a great route. Nice chatting with you all.